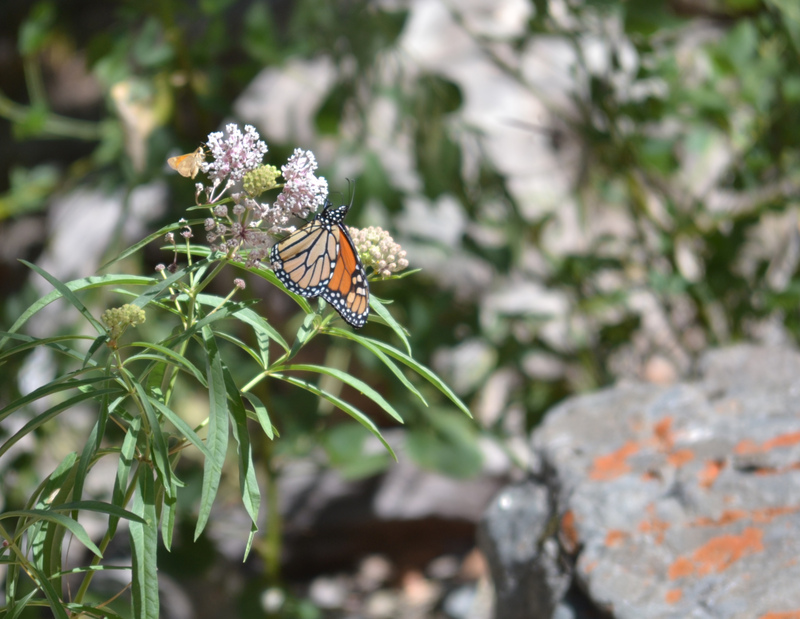 While passing through a creek bottom that is mostly dry this time of year, I spotted a monarch butterfly and got out of my truck to photograph it. It fluttered about and eventually I lost track of it – no photo. Distracted by a California ground squirrel that fed at my feet, I photographed what was available – the squirrel. While returning to the truck, the monarch appeared again and I followed it until it landed on a plant – apparently the same species of plant that it had lit on before. I snapped a few quick photos before the butterfly disappeared again. I theorized that the plant was a milkweed. When I returned home I looked up the plant. 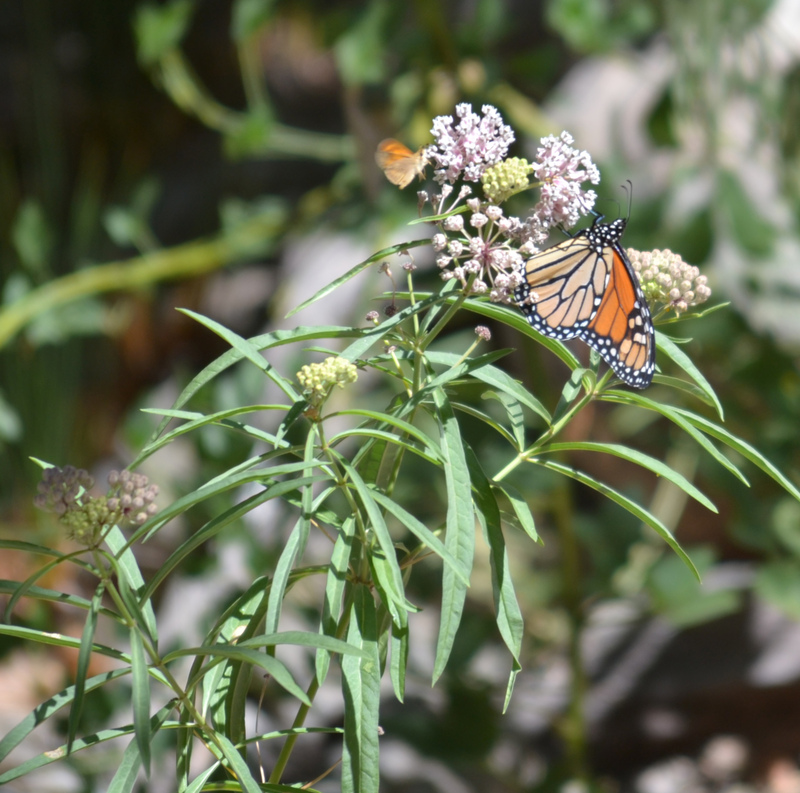 Sure enough it is called “narrow leaf milkweed.” According to an internet source, there are fourteen species of milkweed in California. 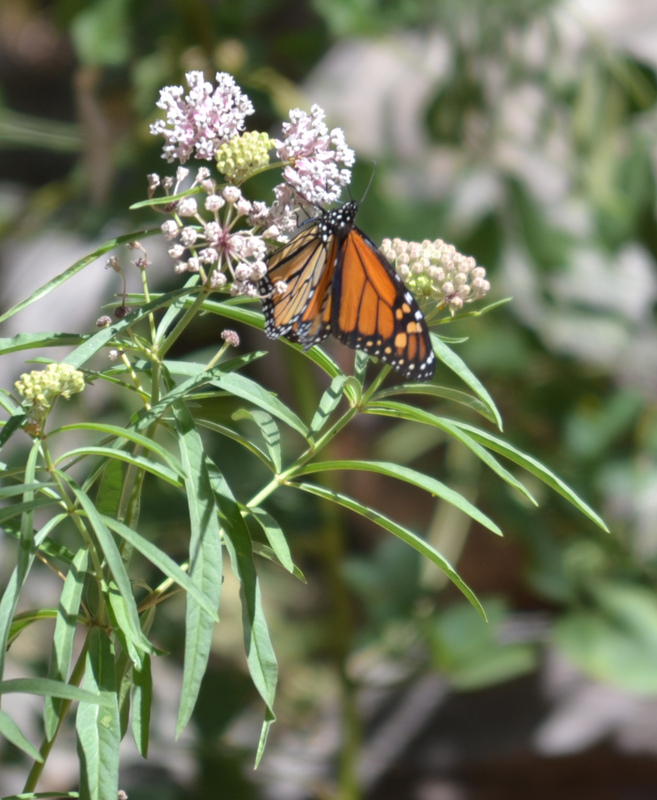 Later I found out that the narrow-leaf milkweed is also called whorled leaf milkweed and they are a host plant for monarch butterfly larvae. Note: There was a time when I offered guided refuge hunts to California Waterfowl Association (CWA), so they could auction them off at fundraisers. They didn’t raise a lot of money, but it gave me an opportunity to promote the book I was selling and also take inexperienced hunters out for a day of refuge hunting. It was on one of these occasions when Tom Billingsley bid on and purchased a hunt I’d donated to CWA for use at the annual youth day. After the purchase, Tom suggested that we hunt Mendota and he’d bring his son Luke, who was interested in duck hunting. Recently, while cleaning out my office, I found this record of the hunt and I’m posting it here just as written back in the early 1990’s. Mallards are a step above the average duck.Large in size and majestic in appearance, most hunters would rank them on a par with the pintail as the most sought after of puddle ducks. Mallards often come in gliding, but only after tantalizing the hunter with passes on the edge of range, before finally committing to the decoys. A mallard responds to calling more readily than perhaps any other species. There’s nothing that compares to that final approach. Luke Billingsley had never bagged a mallard,until Sunday at Mendota Wildlife Area. His father Tom had been high bidder for a guided hunt on the refuge of their choice, at the Youth Outdoor Fair that was held at Camache HIlls last year. I looked forward to guiding them, knowing that their duck hunting experience had been limited. As we passed through the check station and headed out to parking lot #2, Tom asked a few questions about my choice of hunting location and the gear we would carry with us. He and Luke were eager to learn so they would be prepared to hunt on their own in the future. 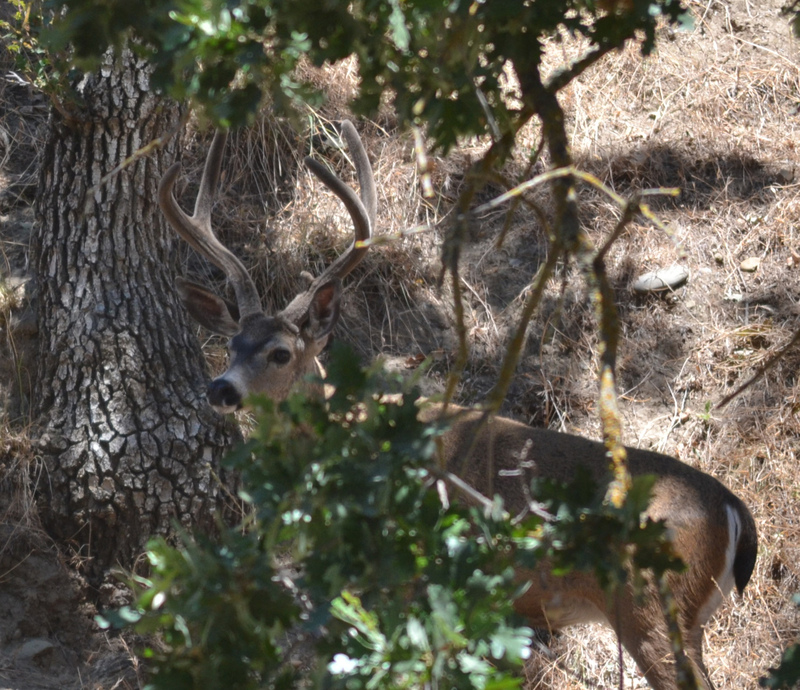 I had scouted the area, on Saturday, the afternoon before and had selected four potential blind sites – just in case the area turned out to be crowded. My concerns were unfounded and we had almost no competition for the limited number of ducks in the vicinity. We selected a large pond with a tule patch big enough to hide the three of us. The patch was located just to the north of the center of the pond, ideal for the north wind that clew steadily, but not with as much vigor as we would have preferred. Our three-dozen decoys were spread on the leeward edge of the blind. Hoping that shooting a duck would be easier to demonstrate than describe, I agreed to his suggestion. Shortly thereafter, two mallards passed by and I called to them. They swung in just out of range. After they had passed, I called again. Immediately they banked and returned towards the decoys. As they passed directly overhead, at about 25 years, I pulled up on the closest. At the shot, both birds froze in mid air as if hit by a bolt of lightning. After a moment’s pause, I realized that Luke and I had fired at exactly the same time. We had been a deadly duo. We had a couple other close calls and one large flock of teal left us feeling silly, but the morning hunt held little excitement after about 9:00 Am. We did stick it out until nearly noon, but finally we decided it was time to eat lunch and shift to our afternoon hunting site. The area near parking lot 17 is located south of and adjacent to the closed zone. We decided to give it a try. About 3:00 PM, ducks began to work. 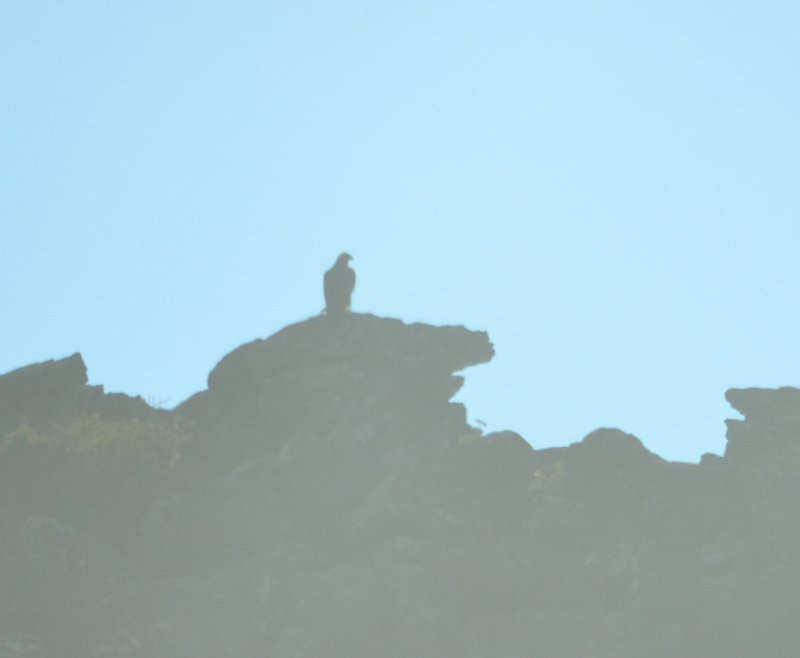 For about an hour the activity was fast, but most of the birds stayed just outside our shooting range. Finally a drake mallard responded to the call and passed overhead. Luke unloaded with Tom and I firing for good measure. The bird flew about 150 yards before it fell dead. Although the greenhead was the last duck of the day, the remainder of the afternoon was interesting, as duck after duck tested the area, but refused to come within range. When we were done, Tom and Luke exclaimed that they were anxious to return and conduct a duck hunt on their own. In addition to having a good outing, we had also accomplished our main objective. Postscript: During the twenty plus years since this hunt, Tom Billingsley and I have remained frequent hunting partners. We currently share a private blind near Volta and occasionally hunt the public areas together. Luke lives near Tom in Lemoore and has two children of his own. Been to the ranch a couple times. Lots of eagles were out on Sunday, but today was for the deer. 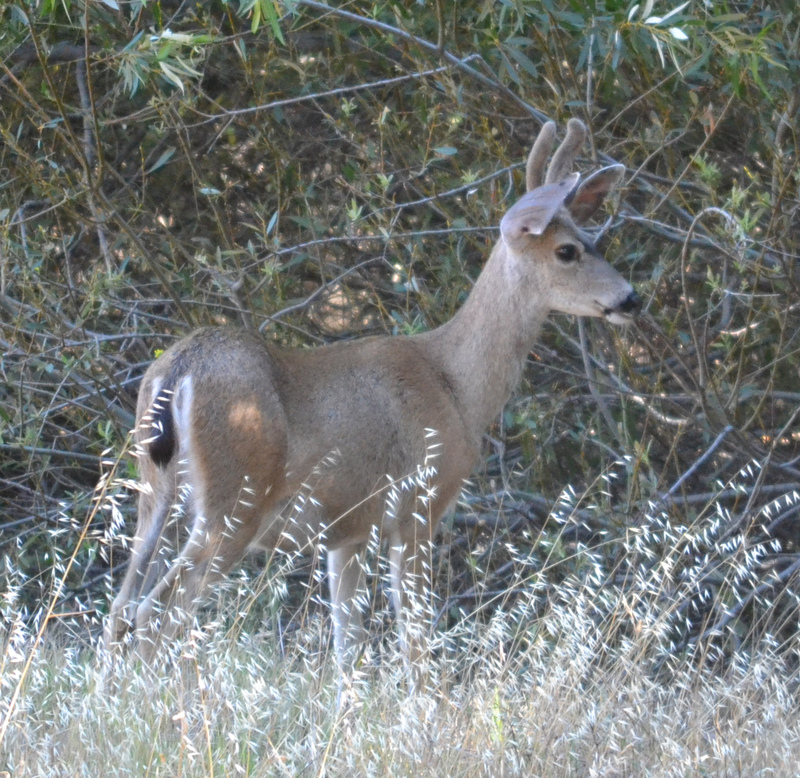 Deer numbers are down, but at least they came out of hiding today. 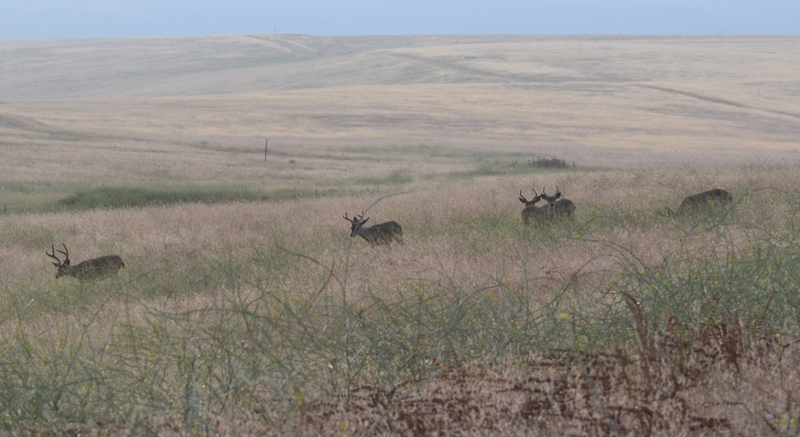 Group of young bucks out at first light. Took this photo through the windshield. Some snakes are still out. This gopher snake was long and skinny. 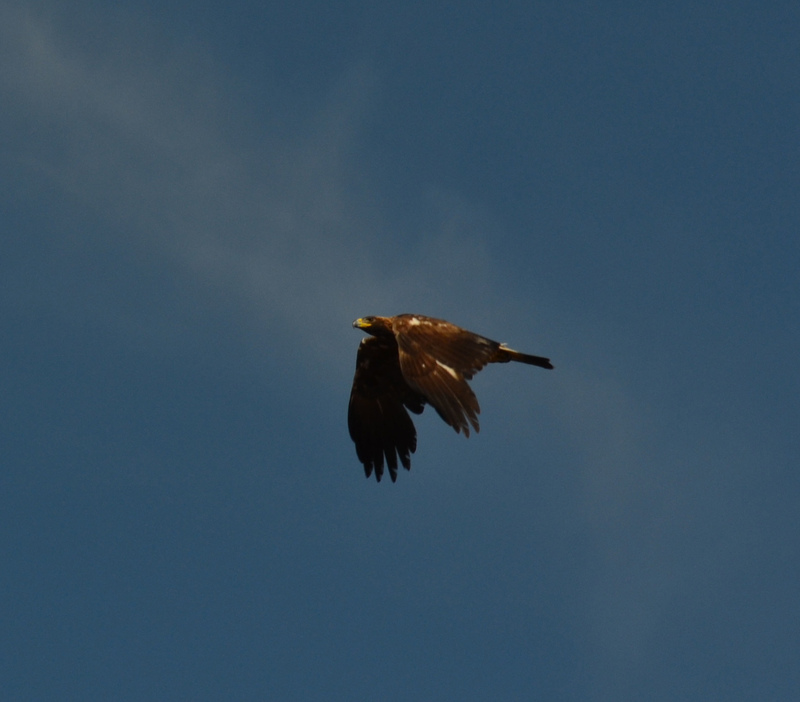 Caught this eagle passing over. This spike hangs out with two others about the same size. I see them almost every time I go to the ranch. 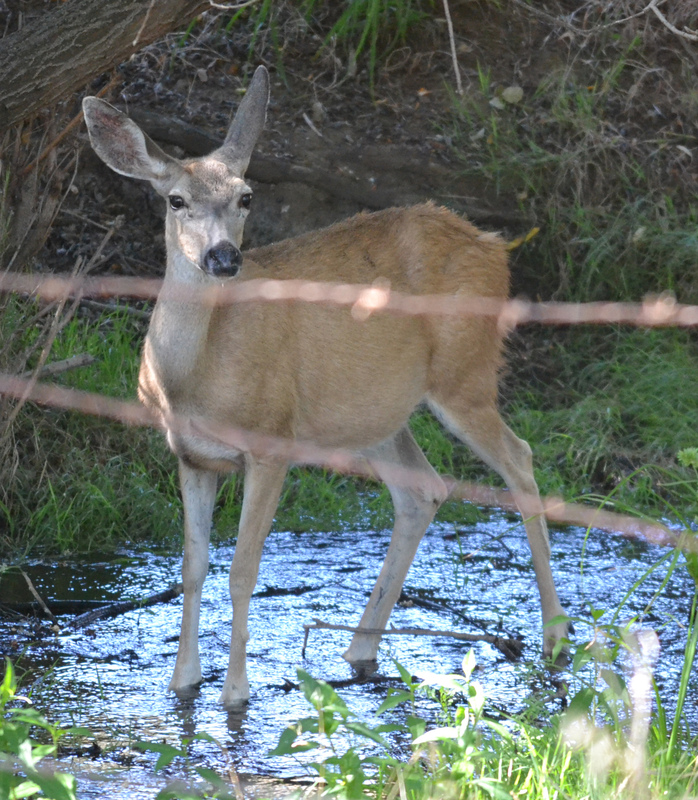 Where there’s water there are deer.